We celebrate an unusual day at our house, April 15, tax day. No, it's not because we're getting a refund (we've usually gotten it and spent it by then :) ), but it's the day we get Bill back. Starting from about the middle of December to April 15 is a very stressful, very busy time for Bill at work. Although this year was a little better in that he didn't work so many Saturdays, I think it was a little more stressful with all they've got going on at work. I'm just glad he didn't go into public accounting as we'd really not see him at all during this time, so it could be worse. However, by the time April 15 rolls around, we're ready for a party. We're ready to have a happy, relaxed Dad around again, so we throw a party for him. We celebrated with a very clean house, taco salad, the "special plate", german chocolate cream pie, pepsi, and a time to snuggle with dad and just relax together. It was a good night. Ahhh, I love tax day! A little slow, but at least it's not May yet. We had a great Easter weekend, despite all the snow. It was so nice to just relax and watch conference - about 5 more and I think I'll have my cross-stitch Santa done, I think I've been working on it for about 5 years now. :) We colored eggs on Saturday night. And in between sessions on Sunday, we had our hunt for their baskets. Bill and I hid them all upstairs. 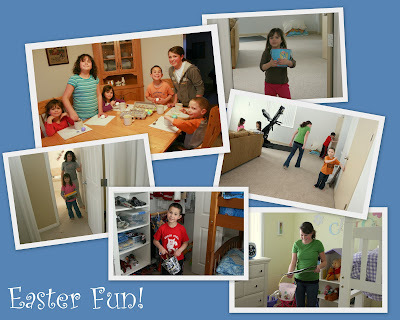 The kids ran up, did a quick run through all the rooms and announced they couldn't find them. I told them to look again, with their eyes open ;) , and they started looking a little closer. It still took them quite a while and some clues from me before they finally found them. We had a nice dinner at home and just enjoyed being together the rest of the day. Hi I just need to make a quick post about one of my favorite websites - Snapfish! I do pretty much all my photo printing from them, unless I'm in a big hurry and need one hour. The quality is excellent, the colors are fantastic, and the prices are really good - especially when I wait until it's a free shipping promotion. Anyway, I just found a contest on rockinmama.net where you can win a $50 gift card to Snapfish. I can always use more credits for prints as I'm slowly making my way to catching up and keeping current my scrapbooks, so I get an extra entry if I blog about it. Go check it out!